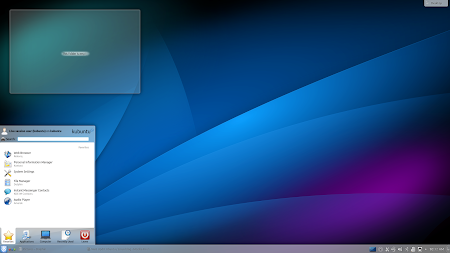 Kubuntu 13.04, the KDE-based Ubuntu flavor, has been released yesterday. Let's take a quick look at what's new. many other improvements to Okular, Konsole, Kontact, Games and so on. Kubuntu 13.04 supports UEFI Secure Boot. Kubuntu 13.04 comes with the following packages: Plasma Desktop and Applications 4.10.2 (so all the Plasma Apps are at version 4.10.2: Dolphin, Gwenview, Konsole, Okular, Kmail, Dragon Player, etc. ), LibreOffice 4.0.2, Rekonq 2.2.1, KTorrent 4.3.1, Amarok 2.7.0, K3b 2.0.2 and Muon Suite 2.0.0. For other changes which are shared between all Ubuntu flavors, see: Ubuntu 13.04 Available For Download [Screenshot Tour, Video]. Those of you who have installed Kubuntu 13.04 alpha/beta and used Muon Update Manager (or via command line, etc.) to upgrade the packages, already have the final Kubuntu 13.04 release so there's no need to reinstall it. Tip: Kubuntu 12.04 and 12.10 users can install KDE SC 4.10 via PPA.